Māori writers, editors and publishers converged on Massey University’s School of Māori Studies in Palmerston North last night to recognise the best Māori books published over the past 12 months. 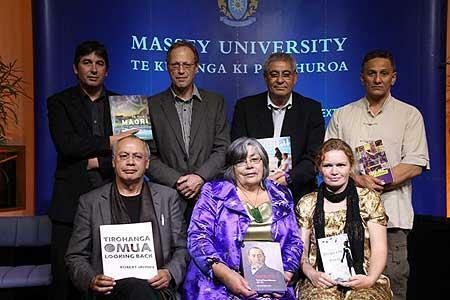 The 2011 Ngā Kupu Ora Māori Book Awards celebrated a number of milestones in a moving, bilingual ceremony, where winning authors discussed their inspiration with humour and waiata. Tina Makereti won the inaugural Fiction award for her very first book - Once Upon a Time in Aotearoa. The book of short stories puts traditional Māori myths and legends into a contemporary context and, due to her time as a student at Massey University, Makereti said the award “felt like it was coming from whānau”. 2011 was also the first year that the winner of the Māori Language category was written completely in te reo, reflecting the growing diversity of books published in te reo Māori. Chris Winitana won the award for Tōku reo, Tōku Ohooho (My Language, My Inspiration), a book about the revitalisation of the Māori language that has also been published in English. Three further books were also recognised at the 2011 Ngā Kupu Ora Awards. The head of Massey University’s Te Pūtahi-ā-Toi (School of Māori Studies), Professor Robert Jahnke, won the Arts category with Tirohanga o Mua: Looking Back, a book which began life as a catalogue for his retrospective exhibition at Te Manawa Art Gallery in 2010. The Biography award was won by Joseph Pere for Wiremu Pere, a book about the life of his great-grandfather, a politician and advocate for Māori land rights in the late 19th and early 20th centuries. Due to illness, the award was accepted by Joseph Pere’s sister Trudy Meredith, who described her pride in her tipuna and the many challenges he overcame. Te Taiao: Māori and the Natural World, the content of which originally appeared online as a part of the Ministry of Culture & Heritage’s Te Ara Encyclopedia of New Zealand project, won the Non-Fiction award. Senior editor Jock Phillips said the Te Ara team was extremely proud of the book and, while they had previously won awards for their website, the Ngā Kupu Ora award “probably means the most to us”. This year’s ceremony also included a special award for Mana Magazine, which published its 100th issue in May 2011. The award was to acknowledge Mana’s important role as a positive Māori voice, and to celebrate a milestone in Māori publishing. Mana editor Derek Fox said that he was “very moved, but quite shocked” that Massey had decided to honour his magazine. He described the financial challenges of publishing a privately-owned and funded Māori magazine, but said he would continue to do so, at least for the foreseeable future. The Ngā Kupu Ora Māori Book Awards were established in 2009 by Massey University to mark Māori Language Week and to celebrate and encourage excellence in Māori literature and publishing. At that time, it was felt that Māori books were being overlooked by mainstream competitions. The awards are named after the library collection of Māori resources established by Massey University in 2005. Ngā Kupu Ora translates as ‘the living words’.